Minford MS Quiz Bowl Championship Team. Back Row – Left to Right: Lucy Grashel, Annie Coriell, Jimmy Adams, Nevaeh Porter, Grant Wheeler, Coach Theresa Havens. Front Row – Left to Right: Landon Boston, Delaney Bowen, Brody Pack. Portsmouth MS Quiz Bowl Runners-Up Team. Back Row – Left to Right: Coach Brandon Pate, Reagan Cartee, Landon Adkins, Piper Cunningham, Zach Roth, Caden Kearns, Andrea Chalfan, Rasmit Devkota. Front Row – Left to Right: Richard Robinson, Olivia Dickerson, Sydney Johnson, Katie Born, Robert Heater. The Minford Middle School team once again went undefeated at the South Central Ohio Educational Service Center (ESC) Middle School Quiz Bowl Tournament, on Wednesday, Oct. 26, to keep its county champion status. The Portsmouth Middle School team was Runner-Up in the competition. “I know the success is because of the wonderful teachers and academics that Minford provides. 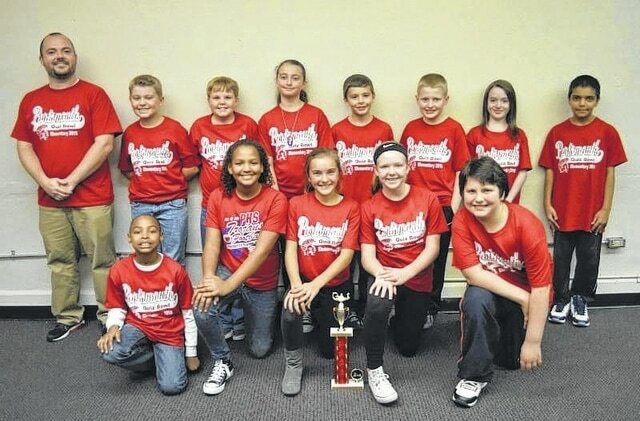 I am so proud of my team who worked diligently this year,” said Minford Middle School Quiz Bowl Coach Theresa Havens. Eighty-one students competed from eight school districts, including Minford, West, Wheelersburg, Green, Portsmouth, Valley, New Boston, and Notre Dame. “There are different categories, and for the middle school, which is fifth and sixth grade, it’s reading vocabulary, geography, life science, fine arts, mathematics, spelling, physical science, world history, grammar, and current events. Then there’s a lightning round that can include questions from any category,” said Sharee Price, director of the ESC Gifted Services Department. The first seed of tournament was played in two rounds, where Minford, Portsmouth and Valley finished undefeated 2-0. Minford and Portsmouth had the highest combined scores which allowed them to advance to the finals. The event is organized each year by the Gifted Services Department of the South Central Ohio ESC. In addition to the Middle School Quiz Bowl, the ESC also hosts an annual Junior High Quiz Bowl, and multiple High School Quiz Bowl matches throughout the year. The next competition will be the Junior High Quiz Bowl, on Wednesday, Nov. 2, from 4-8 p.m.
“It’s wonderful to see students grow in self-confidence and learn to work together as a team through participation in academic competition.” Price said.